Your report on the long overdue Morgan statue has been shown to me. Plainly there has been a misunderstanding. It most certainly was not a “tongue in cheek” proposal. The widespread affection and admiration for Mr Morgan demands nothing less. For example, indicative of the emotion stirred by this announcement, the chief Ombudsman Mr Peter Boshier, has generously offered himself as a ceremonial human sacrifice when the foundation stone is laid. He won’t take no for an answer. As for the difficulties you describe there’s a simple solution, namely ask Mr Morgan. I gather that following imminent publication of his next two books (“Why Einstein’s Theory of Relativity Is Wrong” and “The Cure for Cancer”) written simultaneously, a pen in each hand, Mr Morgan will then be available to address your concerns. Earlier this week MSD released a report that found gang members had cost Work and Income, and Child Youth and Family $714 million in the 22 years between 1993 and 2014. I commented earlier that the annual cost of each gang member works out to $8,948 annually (3,627) - less than a superannuitant. The remark was flippant. But I did mentally muse that raising the super qualifying age to 67 (in line with other countries we like to compare ourselves to) would save far more than $714 million over 22 years. On a serious note - and the problem of gangs and their children is a very serious issue - the all-up cost to the tax payer is much higher than $32 million annually. A few other major costs can be roughly (but totally unscientifically) calculated. "7,075 dependent children were included in benefits with gang members for an average of 2.8 years." Not very long because the children would generally be included in the benefits of their mothers. I reckon doubling the cost would be conservative. There's another $64 million. "As of April 2013, gang members and affiliates comprised over 30 percent of inmates, with over 10 percent of the prison population belonging to the Mongrel Mob." Thirty percent of prisoners equates to around 2,400 @ $100,000 each which represents a yearly bill of $240 million. Next is the cost to the Justice system. It costs $450 million to run the Ministry of Justice. May as well carve off 10% of that for gangs. A further $45 million. And the police of course. Their annual budget is $1.4 billion. Let's be conservative again and say 10% is spent on dealing with gangs so $140 million annually. I guess ACC would have some involvement but wouldn't like to hazard a guess at a number. Or $143,645 for each gang member on average. Credible? Maybe I've over-stated costs - maybe not. What I haven't done is include the Health system costs from violence and ill-health; nor Customs involvement nor Housing NZ. While the MSD numbers were somewhat underwhelming, and expressed as a 22 year sum, not very helpful, this further exercise has rammed it home to me that breaking the cycle of inter-generational gang membership and activity would have enormous benefits for everybody. 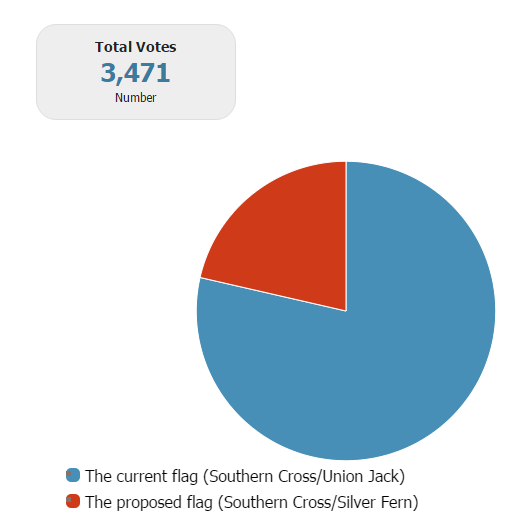 Radio NZ is running a "highly unscientific" poll. I found this a fascinating read. Oh how I wish that we had such variation and delineation of ideas in this country. Ron Haskins lays out the difference between 1/ Democrat and Republican voter attitudes to poverty and 2/ the various anti-poverty/ poverty (some will make poverty worse) policies espoused by individual candidates. My pick is Cruz' flat tax though his social conservatism would preclude me voting for him. The main difference: The Republicans would transfer authority over how the money is spent to parents and to states and localities. If the specific proposals being offered by Bush, Kasich, and Rubio on programs for the poor were adopted, it would represent a historic shift in responsibility and control from the federal government to the states and to parents. By contrast, Clinton and Sanders would greatly increase the amount of money controlled by the federal government, an increase mainly secured through tax increases on the rich. MSD are going to conduct trials designed to intervene in gang life and improve their children's outcomes. It's got to be better than trying to stamp gangs out - colossal failure. The alleged perpetrator of abuse or neglect of gang member’s children was more often recorded as the child’s mother than the gang member father. Well, well. Though the perpetrator status is 'alleged' and not 'substantiated' . Maybe she is fitted up or takes the fall. Or maybe she just is the abuser. 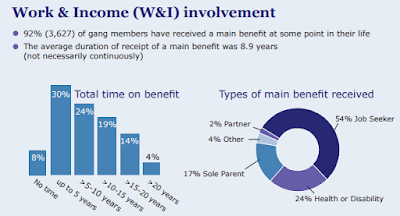 Ninety-two per cent (3,627) of the total 3,960 known gang members received main benefits from MSD at some stage between 1 January 1993 and 31 December 2014. Eighteen per cent of all gang members had received a main benefit for a total of over 15 years, whereas 13 per cent received main benefits for two years or less, and eight per cent had not received main benefits at all. Is there any other group in society that can boast this degree of welfare dependence? None I can think of. Even the blind have better rates of employment and self sufficiently (no disrespect intended). And that's just the benefit the gang member receives directly. What about the mother of his children? And those stupid lefties carry on with the assertion that welfare reduces crime ergo welfare reform will increase it. 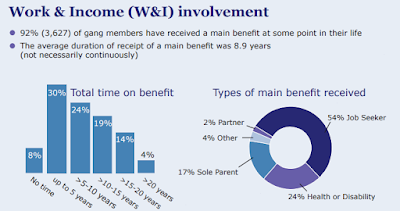 Welfare is staple diet for gangs but certainly only a small part of their real incomes. The total cost amassed to MSD (includes CYF) was $714 million over 22 years by 3,960 gang members. $8,195 annually. Cheaper than a superannuitant. 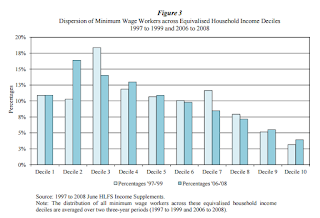 Minimum wage earners wealthier than their employers? 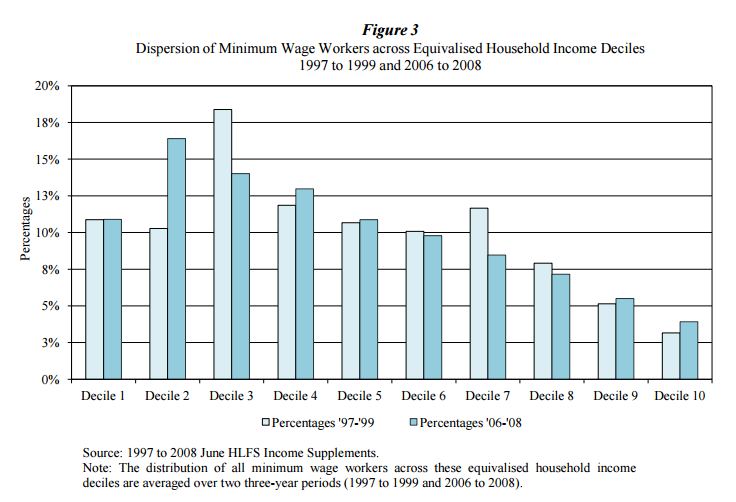 The following graph shows that a substantial portion of minimum wage workers live in relatively wealthy households, possibly wealthier households than their employers. Still the state demands employers pay more. 1/When Ruth Money - an independent advocate for victims, particularly of sexual assault - took questions, two were from young members (male and female) who wanted to know whether she had concerns about 'victims' who were those falsely accused of crimes but acquitted. Should there be compensation for instance? This warmed my heart. It's very encouraging to hear the evidence of young minds appreciating the importance of justice at a more nuanced level, especially in ACT. It would be very bad form for a fellow speaker to ask a question when the time was limited but the one in my mind was similar. Does she have any concerns about the increasing numbers of people imprisoned without trial? 3/ Retirement funding specialist Michael Littlewood saying whatever policy decisions we make today will not effect what taxpayers choose to pay to support retired people at any time in the future. In 2066, or 2046 or 2086. Think about it. 4/ Seeing a couple of ex Libertarian buddies in attendance, and Don Brash still taking an interest. Just sorry I couldn't find the time to say hello to many familiar faces. 5/ Not seeing John Banks there (nothing personal. I just never thought he promoted the ACT values I identify with). 6/ David Seymour's refreshing resemblance to a real person and not a real politician. There was widespread popularity for his decision not to accept a ministerial role. Whatever the media reports it was a very positive, good-humoured and forward-looking conference. For them everything from science to the law is “settled” once they get into power. Progress is a one-way street. Their mindset is the very definition of closed-mindedness. The easy answer would be “they are all bad people.” But frankly that’s a cop-out. Not all liberals are bad people, any more than all conservatives are angels. No doubt among the fevered minions of liberal activists there are people with, shall we say, psychological issues, but that doesn’t explain why so many otherwise reasonable people are so beholden to liberalism as an ideology. The short answer is that it pays. A lot of people in and out of government benefit. Liberalism also makes people feel good. Whether you are politician dispensing government benefits or the citizen receiving them, liberalism hides the self-interest and sometimes even greed that motivate people. But the devolution of liberalism into something now openly illiberal has causes far more complex than these familiar explanations provide. For one thing, liberalism is no longer mainly about ideas. It is about power—as in who has it and who doesn’t. Believing they already know the answers to all questions, liberals view politics and governing as mopping up operations.